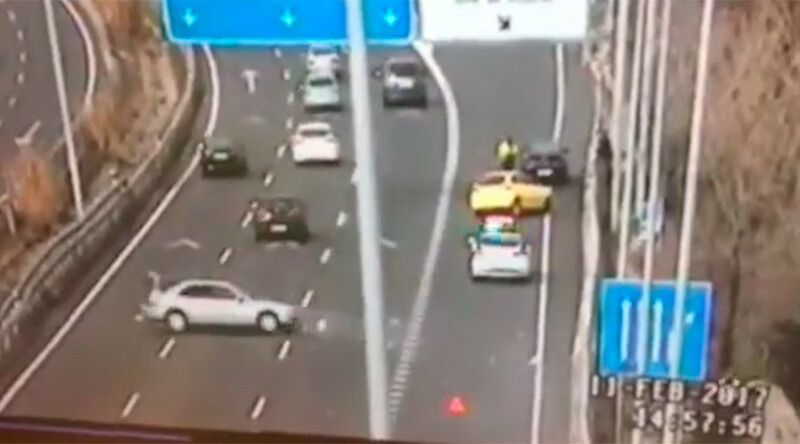 Dramatic footage shows a Spanish police officer narrowly escaping death by jumping over a barrier as an out-of-control car speeds towards him on a busy Madrid motorway. The near-death experience happened as the traffic cop and his colleague were dealing with a minor incident between two other vehicles on Madrid’s M-607. The officer, who was directing traffic, spotted a car heading straight for him at high speed and instinctively jumped over the barrier at the side of the road. Just moments later the car smashed backward into the barrier before spinning into the center of the road and hitting the barrier on the opposite side. The officer then leapt back over the fence, halting traffic as he rushed to assist the crashed vehicle’s occupants. The footage was captured by Department of Transport road cameras and published on the Guardia Civil’s Twitter account. The officer has been branded a hero for his quick-thinking reactions, with even Spanish Interior Minister Juan Ignacio Zoido joining in on the praise. Zoido shared the video online, thanking members of the security forces for risking their lives every day to protect the public.